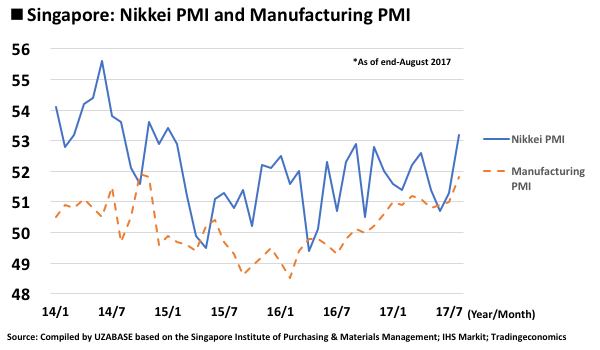 During 1–15 September, the Nikkei Manufacturing Purchasing Managers’ Index (Nikkei PMI), a leading indicator for economic conditions, was announced for each ASEAN economy, amongst other critical macroeconomic indicators. Also during that time, the Central Bank of Malaysia (Bank Negara Malaysia, BNM) held the Monetary Policy Committee (MPC) Meeting, while Indonesia began ramping up its infrastructure development and construction. Please refer to the table attached at the end of the report for an overview of the macroeconomic indices for ASEAN economies. Although Indonesia’s retail sales decreased by 3.3% YoY in July, this is thought to be a reactionary decline from the strong consumption activities that lasted until the Lebaran holiday, which marks the end of the fasting month of Ramadan in the Islamic calendar, as mentioned in the previous report. As the period of Ramadan, which is determined based on the Islamic lunar calendar, changes every year in the Gregorian calendar (e.g. 2016 Ramadan: 6 June–5 July; 2017 Ramadan: 26 May–24 June), statistical comparisons on a year-on-year basis tend to be irregular. Inflation rate (CPI) growth continued to slow for the second consecutive month from its peak level of 4.4% YoY in June, standing at 3.8% YoY in August. Moreover, core CPI growth decelerated for the fifth consecutive month to 3.0% YoY in August from the 3.4% YoY recorded in February. Overall, the country is undergoing gradual inflation with the exception of food and energy prices. Apart from economic indicators, Indonesia has been progressing with its infrastructure development through, for example, the construction and maintenance of airports and harbours. Local media has also been reporting new projects with specific dates and periods provided, including those facilitated by the Japan International Cooperation Agency (JICA). 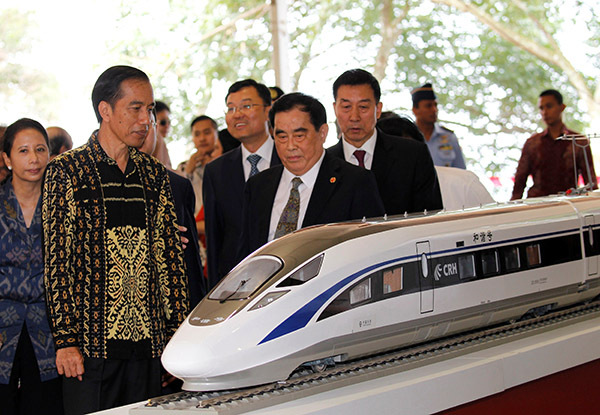 Lately, the construction projects for a high-speed railway that connects Jakarta and Bandung, which is led by China, and a new airport in Karawang, West Java are reported to have been facing difficulties. Major news and updates in connection with the country’s infrastructure projects are summarised below. 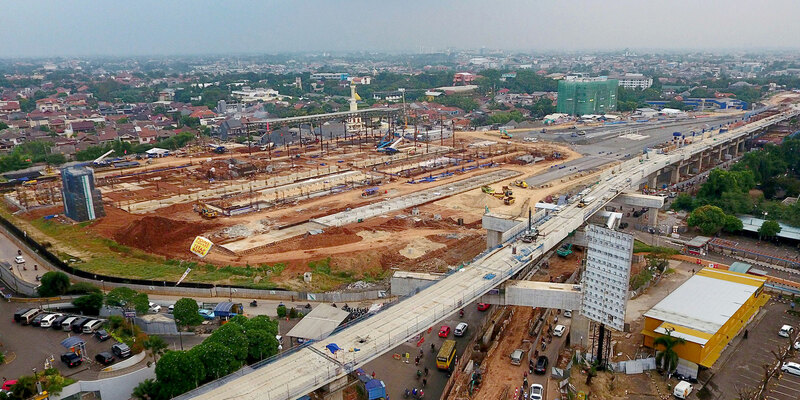 - The completion rate for the construction of a high-speed railway connecting Soekarno–Hatta International Airport and Indonesia’s capital city Jakarta reached 82% (according to Budi Karya Sumadi, the Minister of Transportation). - The expense for the remodelling of Terminal 2 at Soekarno–Hatta International Airport is estimated to reach IDR 3.2 trillion (USD 240.96 million). The remodelling work, despite a lack of a detailed time frame, is scheduled to start after the construction of Terminal 3 is launched. The construction of Terminal 3, originally planned for April 2017, was postponed due to the significant delay in land acquisition. The construction of Terminal 4 is planned for 2019 (according to Angkasa Pura, an Indonesia state-run airport management enterprise). - The construction of Patimban Port, located in Subang, West Java Province, is expected to be launched in early 2018, funded jointly by the JICA (providing a loan of roughly JPY 109.7 billion, or USD 1.0 billion) and the Indonesian government (public budget of USD 90 million). The Phase I and Phase II construction works are planned to be completed in 2019 and 2023, respectively (according to the Ministry of Transportation). - The completion rate of the redevelopment project (Phase I) for Kuala Tanjung Port in North Sumatra Province has reached around 80% (according to state-owned port operator Pelindo I). - The Jakarta Light Rail Transit (LRT) project is expected to conclude a funding contract in November 2017 (according to Luhut Binsar Pandjaitan, Coordinating Minister for Maritime Affairs). - The construction of Bogor-Sukabumi double track railway is scheduled to begin within 2017, with the total investment value amounting to IDR 400 billion, or USD 30.12 million (according to Budi Karya Sumadi, the Minister of Transportation). - For the high-speed rail connecting the capital city of Jakarta and Bandung, West Java, existing lines will likely be used instead of building new tracks due to the land acquisition obstacle, as per a meeting between Indonesian Vice President Jusuf Kalla and Indonesian Transportation Minister Budi Karya Sumadi. - The development of a new airport in Karawang, West Java, extending southeast of Jakarta, was halted with no specific date of restart, as the provincial government decided to prioritise the construction of Kertajati Airport in Majalengka (according to Agus Santoso, Director General of Air Transportation). 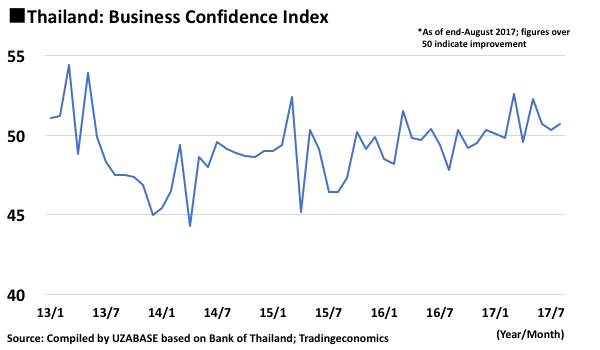 Thailand’s August BCI improved slightly to 50.7 from 50.3 in the previous month, exceeding 50 for four months straight and indicating a sound business environment. CCI also continued to increase to 74.5 in August. 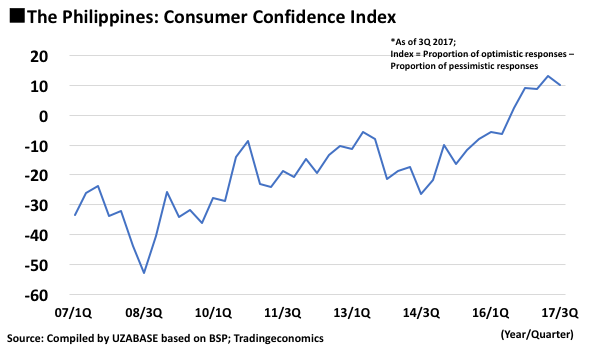 However, consumer confidence has been levelling off over the long term, and the possibility of an instant, significant recovery might be remote. Despite an upturn in business sentiment from the supply side, whether or not the demand side will follow the lead with consumers becoming willing to spend requires further attention. BNM held the MPC Meeting and decided to maintain the policy interest rate at the current level of 3.00%. 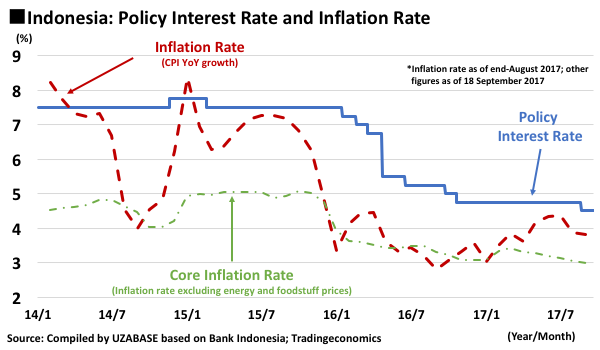 According to the Monetary Policy Statement, the current policy interest rate level is appropriate with no need of change in light of the high GDP growth rate for 2Q (5.8% YoY) and stable commodity prices. Furthermore, BNM predicts that the full-year GDP growth rate for 2017 will likely exceed the projection of 4.8% YoY, driven by favourable exports. 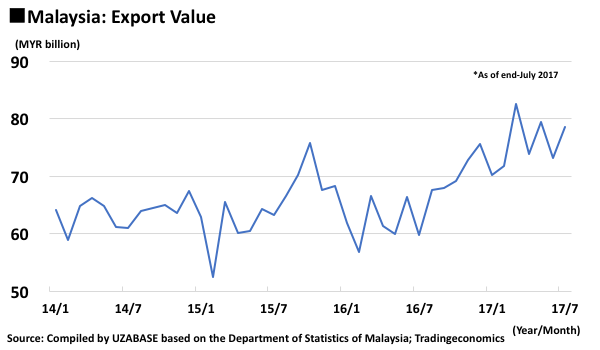 On 6 September, Malaysia announced its July export value, which experienced striking growth by 30.9% YoY to reach MYR 78.6 billion. This is attributable to the recovery in crude oil prices, rising exports for the country’s major export products of palm oil and natural gas, and a favourable trend for semiconductor exports alongside the increasing demand for the global IT sector. 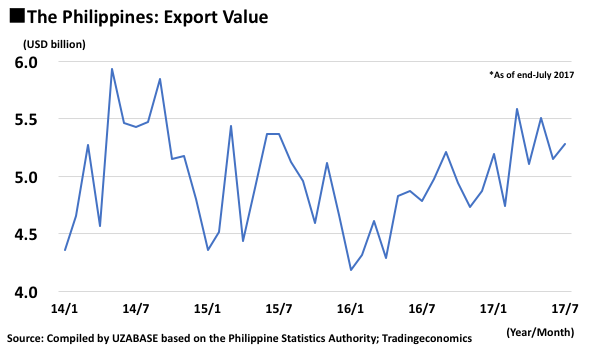 The Philippines released its balance of trade for July with a deficit of USD 1.65 billion, which narrowed from the USD 1.99 billion recorded in June. Exports showed a substantial increase of 10.4% YoY to USD 5.28 billion; electronic devices, which account for more than half of the country’s consumer product exports, expanded the most by 11.8% YoY, driving the overall exports. 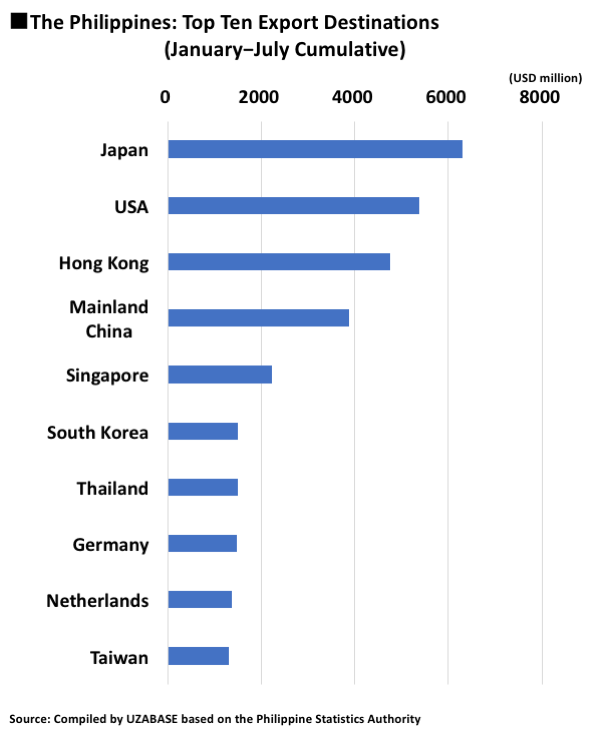 Exports to Japan, the country’s largest export destination, decreased by 6.1% YoY, but those to Hong Kong and Mainland China reported remarkable growth by 32.5% and 18.2%, respectively. Over the long term, it is increasingly likely that the two regions will take over and become the Philippines’ largest trade partners. The Central Bank of the Philippines (The Bangko Sentral ng Pilipinas, BSP) released the CCI for 3Q on 10 September, and the figure showed a slight decline compared to the previous quarter to 10.2 from 13.1. However, it should be noted that the statistical method the country adopts for the calculation of CCI is different from other economies, under which the figure represents the value of the proportion of respondents with an optimistic view subtracted by that of respondents with a pessimistic view. Hence, this figure should be interpreted as an expectation index, and with this in the background, the CCI denotes a continued, strong consumer sentiment in the country. In addition, inflation increased by 3.1% YoY, retail price index (RPI) rose by 3.3% YoY, and wholesale price index (WPI) fell by 1.0%, all indicating a stable trend. Singapore released the Manufacturing PMI for August, which edged up to 51.8 from 51.0 in the previous month, and has remained favourable at above 50 for 12 months straight since September 2016. The August Nikkei PMI also improved to 53.2 from 51.3 in July, hitting a record high since May 2016, when it first exceeded 50. The country’s 2Q GDP growth rate shows that the manufacturing sector expanded by 2.8% YoY. Overall, the two types of PMI both suggest the sector is buoyant at present. The unemployment rate for 2Q levelled off at 2.2% from the previous quarter, with no particular points of concern. 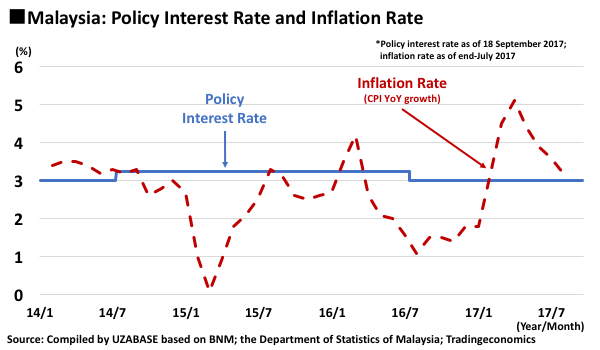 During 1–15 September, Malaysia released numerous critical indicators, including a sustained policy interest rate at 3.00% and a striking increase of over 30% in exports compared to the previous year. These figures suggest the country’s economic growth will remain favourable throughout 3Q. Likewise, Singapore’s economic prospect is optimistic in light of the healthy indicators for the manufacturing sector (Manufacturing PMI and Nikkei PMI), the key driver for the country’s economic growth. 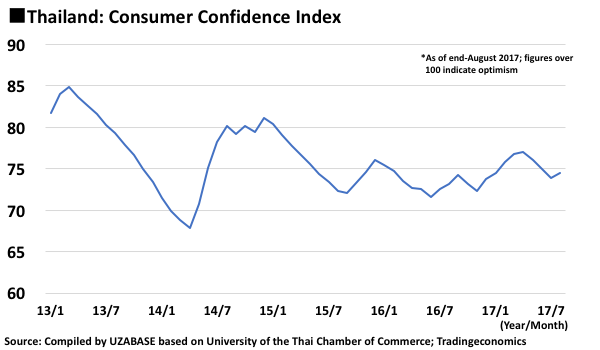 Thailand’s business and consumer sentiments are both on a gradual recovery, but the latter still has room for further improvement. The country is expected to experience a continued yet slow recovery until the end of 2017. The next report will cover the period from 16–30 September and focus on the following indicators in particular (dates in the brackets are scheduled release dates). Indonesian and Malaysian Palm Oil Industry at Critical Crossroads, given EU Resolution to Ban Palm Oil in Biofuels by 2020?